It almost never happens that I know exactly what I'm going to make before I start making it! But this time, it's different. When I finished beading the sunprinted fabric piece last week, I knew that my next project was going to be to paint some more fabrics and use them in a quilt. And that it was going to be silk. And that it was going to be 100% hand stitched. So the first step was obviously to tear up some silk fabrics that I had and paint them. 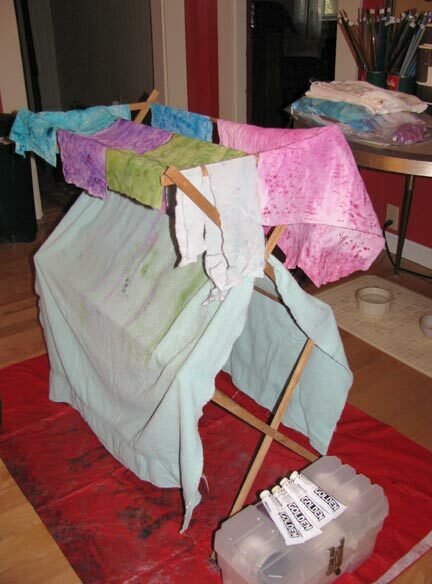 I mostly used the method that I refer to as painting fabrics in a plastic bag. But I also used kosher salt on some fabrics that were laid out in the sun, and I did some sunprinting with ferns on one of the green pieces. 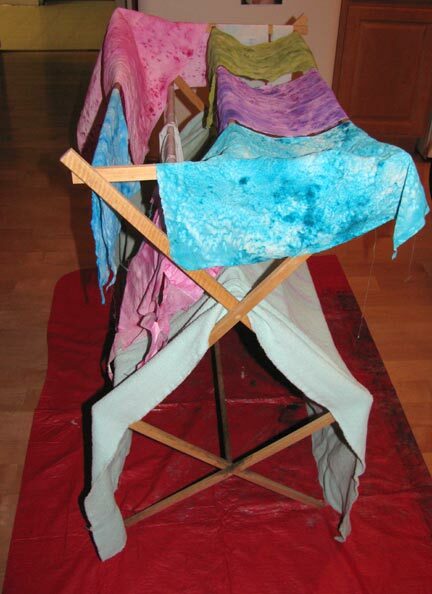 There are a lot of other fabric painting tutorials available at the link. Take your pick, mix and match! I hope to have the quilt layout ready to show you by next week. I have to laugh at the statements "It almost never happens that I know exactly what I am going to make before I start it" and the "I'm a total slob when working"... both fit me so appropriately! I'm glad to know it isn't just me, and I can't wait to see what you come up with. 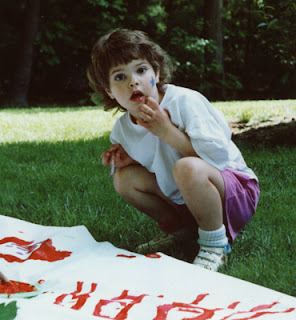 Right now, I am off to check out some of those fabric painting tutorials! :-) I am a slob, even though I don't mean to be. I think most of it is because I'm really clumsy! I liked that statement too! I usually know what I'm going to make, but when I get started it turns into something else. LOL! I love that statement also, but Creativity is Messy! And I love it! You do such beautiful work.